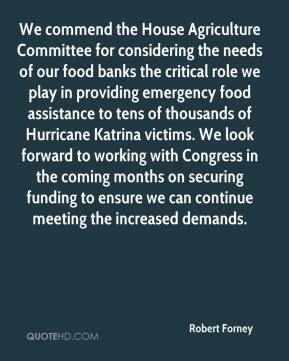 We commend the House Agriculture Committee for considering the needs of our food banks the critical role we play in providing emergency food assistance to tens of thousands of Hurricane Katrina victims. We look forward to working with Congress in the coming months on securing funding to ensure we can continue meeting the increased demands. Hunger was a reality for more than 36 million Americans before Hurricane Katrina hit and today tens of thousands more people are in search of a meal. Our Network has been serving the needs of our neighbors for 25 years and we will continue to do so for as long as we are needed. 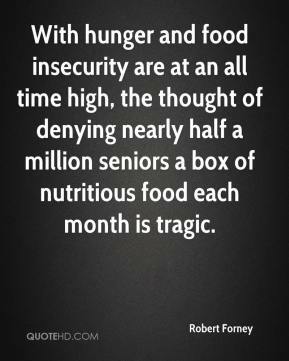 With hunger and food insecurity are at an all time high, the thought of denying nearly half a million seniors a box of nutritious food each month is tragic. 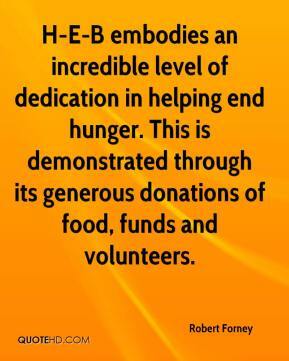 H-E-B embodies an incredible level of dedication in helping end hunger. This is demonstrated through its generous donations of food, funds and volunteers. 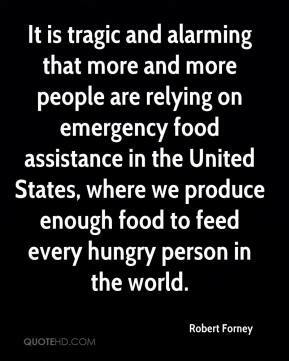 It is tragic and alarming that more and more people are relying on emergency food assistance in the United States, where we produce enough food to feed every hungry person in the world. 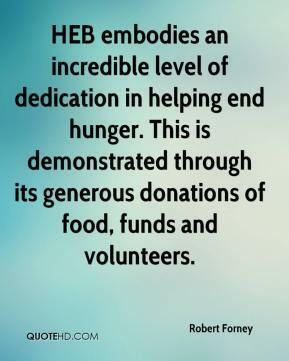 HEB embodies an incredible level of dedication in helping end hunger. This is demonstrated through its generous donations of food, funds and volunteers. Bill Bolling personifies the spirit of public and community service. 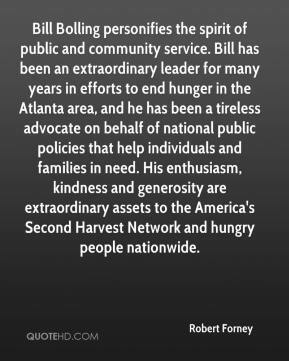 Bill has been an extraordinary leader for many years in efforts to end hunger in the Atlanta area, and he has been a tireless advocate on behalf of national public policies that help individuals and families in need. His enthusiasm, kindness and generosity are extraordinary assets to the America's Second Harvest Network and hungry people nationwide. Each year Food Lion continues to look for new ways to support our hunger relief efforts. They have raised a combined total of $1.2 million in monetary and product donations in just the past two years. 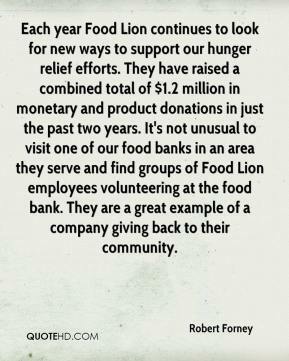 It's not unusual to visit one of our food banks in an area they serve and find groups of Food Lion employees volunteering at the food bank. They are a great example of a company giving back to their community.